I’ve been thinking about doing a post on choux pastry for some time, and having surveyed via Twitter what the general feeling was, I decided that there was sufficient general enthusiasm for the idea, so here it is! Here you’ll find all the hints, tips and tricks that I have picked up from books, television, the internet and word of mouth gathered together in one post to – hopefully – guide you through the steps to producing a successful bake. Choux pastry is not tricky, but when recipes tell you WHAT to do, and not WHY you’re doing it, I don’t think it either helps or encourages people to have a go. I’m hoping that by including the reasons WHY you should follow each instruction, together with, most importantly, what you can SEE at each stage of the process, everyone will enjoy success with this recipe/tutorial. It’s also going to be short on intro, long on explanation, so let’s get on with it! Choux pastry was invented (What? You didn’t think I was just going to write the recipe, did you? Gotta have some history too 😉 ) by the chef of Catherine de Medici in 1533 and is unique in that it is the only pastry that is cooked twice – once whilst being mixed, and again when it is baked. A soft dough of water, butter, flour, and eggs is combined and then either spooned or piped onto parchment paper for baking. Choux pastry can be used to make both sweet and savoury items. On the sweet side are profiteroles, cream puffs, Paris-Brest, religieuses, eclairs, Gâteau St. Honoré, and the impressive croquembouche. Savoury choux buns are known as Gougères and are generally flavoured with cheese and herbs, and occasionally also filled with a thickened savoury sauce. Liquid: Most choux recipes will use water, but I prefer a mixture of water and milk. I think it gives the dough a little extra richness, and helps with browning. Butter: Don’t even think of using anything else. Flour: Two options: plain flour and bread flour. The high protein in the bread flour helps it absorb liquid which will turn into steam in the oven and puff up the pastries. The gluten will help strengthen the pastry crust once cooked, which is helpful if you’re planning on building a structure with the finished puffs. If a more delicate pastry is desired, then perhaps plain flour might suit the purpose better. You decide. Eggs: The emulsifying power of the yolks acts as a kind of glue to hold the butter and the flour together. Just as the high protein in the flour is of benefit, it’s the protein in the eggs that do the same job – and the protein in eggs is the whites. So it’s odd to see so many choux recipes recommending extra yolks be added to choux pastry. It’s not yolks you need at all, its extra whites (maybe). There are several approaches to making choux pastry, from gadget-free to high-tech. Choose the one that’s right for your situation. Saucepan and wooden spoon: The most basic equipment. The saucepan is needed to heat the liquid ingredients, and the spoon to stir in the flour and to keep the mix moving whilst the dough dries. The saucepan should be larger than you think you need, as adding the flour all at once can be rather messy. Once the dough has dried sufficiently, you can then go on to mix in the eggs in the pan as well, but it will give your arms a real work-out. For a couple of reasons, I choose the easier option – gadgets! Mixers: Not compulsory. I have the luxury of a beautiful stand mixer, but electric beaters work just as well, and with less arm ache than the saucepan/spoon combo. Piping Bags: Not compulsory. 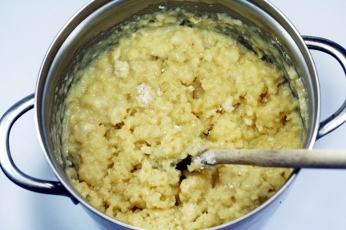 For choux buns, the batter can be spooned out using just a couple of teaspoons. Depending on your skills, this can make for a slightly rustic appearance. I actually prefer to use two teaspoons when making savoury gougères for precisely this reason. If you want a more consistent appearance, then you can use a piping bag with either a plain or star shaped nozzled – 1cm diameter is my recommendation. Finally, a low-budget alternative is a re-sealable freezer bag with the corner snipped off. Oven: Compulsory. Not going to get very far at all without one. 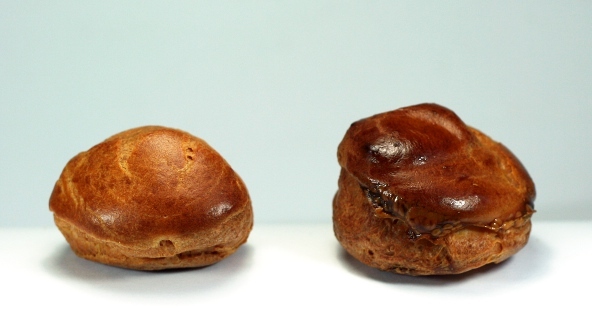 Choux pastry needs to be cooked at 2 separate temperatures in order to achieve the best possible results. Initially, it needs quite a high heat so the dough will rise quickly form a crust that will set the shape of the shells. The temperature is then reduced to allow the outsides of the shells to become firm, while at the same time allowing the insides of the pastry to dry out. Preheat oven to 200°C, 180°C Fan. Sift the flour and set aside , alongside the cooker. Crack the eggs into a jug and set next to your mixer. Put the water, the milks, the butter and salt into a saucepan and bring to a full, rolling boil. Add the flour all at once to the boiling mixture. Take the pan off the heat and stir the mixture into a paste. It will look a bit like scrambled egg. After the flour has been added – it will look a bit like scrambled egg. Keep stirring! Return the pan to the heat, turn it to medium-low and continue stirring until the mixture comes together in a smooth lump and begins to stick to the pan a little. Keep cooking and stirring it around over moderate heat to dry out the dough as much as possible. Time yourself. Three minutes. Seriously, set the timer. The drier the dough, the more eggs it will absorb, the puffier your choux buns will be. 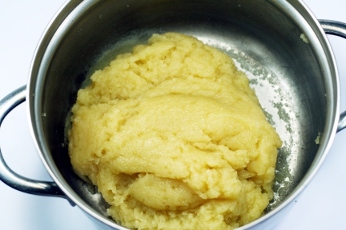 Choux pastry after drying in the saucepan – the dough has become smooth and has come together in a ball. Residue in the pan when the dough has been sufficiently dried. At the end of the three minutes, the dough will have come together in a smooth(ish) lump and there should be a thin film of dried dough on the sides and bottom of the pan. After drying the dough, it needs to cool down a little before the eggs are added, otherwise the eggs will cook upon contact. Rather than wait, be proactive! 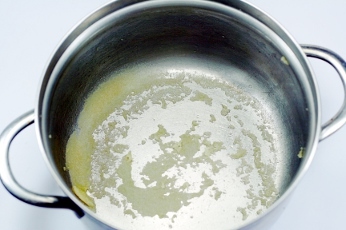 If you’re using just a saucepan and spoon, continue stirring vigorously. If you’re using gadgets, tip the dough into a bowl and and turn the beaters on at the slowest speed. When you can no longer see steam rising from the bowl, the dough is sufficiently cooled. At low speed, add the eggs, one at a time, beating thoroughly so that each egg is fully incorporated before adding the next. Once all the eggs have been incorporated, check the consistency of the dough. Lots of my old recipe book mention ‘a dropping consistency’ when referring to cake and bun mixes – and really, there is no better description I can think of for the consistency we’re looking for. With the paddle of the stand mixer (or whatever you’re using) take a scoop of the pastry batter and see if it will drop smoothly and freely. The consistency should be similar to mayonnaise, or soft ice-cream. If the batter falls in a lump, or doesn’t fall at all, then it is too ‘tight’ and needs to be loosened by adding more egg whites. Do this gradually, adding a little at a time, checking that the egg-whites are fully incorporated before checking the consistency again. 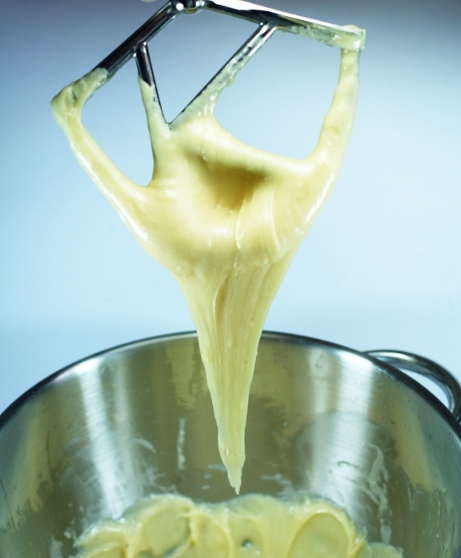 The ‘V’ of choux batter left hanging shows it now has perfect ‘dropping’ consistency. For a perfect consistency, what you want to see is a ‘V’ of batter left hanging once some dough has fallen. The dough should look smooth and glossy. When the consistency of the dough is just right, its time to bake. Fill a pastry bag fitted with a plain tip and pipe out as desired, or spoon out using teaspoons. If you’re especially skilled with a piping bag, then your choux buns will be smooth and sphere-like. I’m not, so mine usually look like Mr Whippy ice-creams. If you leave a point sticking up, it will blacken and burn long before the rest of the pastry cooks, so to eliminate this, wet a finger with water and on each bun, press the tip down gently. Flatten any points of dough (L) with a wetted finger before baking (R). Mix the egg yolk with 1 tbs water and brush over the choux buns. This is optional. Glazing the choux buns makes them slightly darker, and more shiny. The photo at the top of this post has a mixture of both, which I think looks quite nice. You decide. Cook the choux one tray at a time. 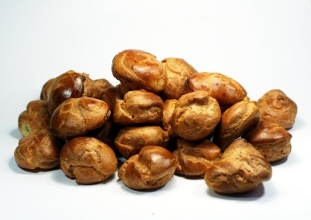 Choux pastry is leavened when the water held in the paste turns to steam in the heat of the oven. Too many trays in the oven at one time will create too much humidity, and wet heat won’t dry your choux buns to crisp, golden orbs – they’ll steam, be soggy and collapse. The additional trays will sit and wait quite happily for their turn in the oven with no side effects. Check for done-ness at 25 minutes (10 mins + 15 mins). NB These choux buns will be a DEEP golden brown when done – and crisp and hollow like a table tennis ball. DO NOT take them out too early, as the insides will still be wet. If you’re not sure, remove just ONE bun and cut it open and see for yourself. 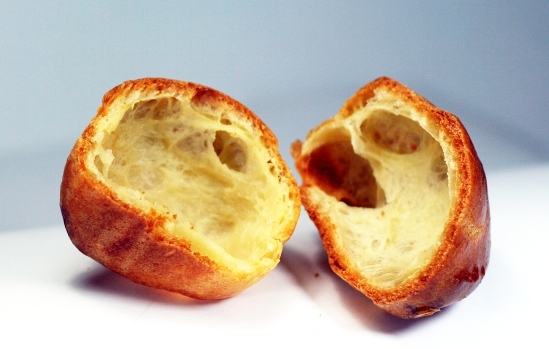 Echo….cho….cho….o…o… Nice and hollow inside a choux bun. Once the buns are cooked, remove from the oven and IMMEDIATELY poke a hole in the base of each with the point of a sharp knife to let out the steam. If you don’t do this, the steam will remain trapped inside and will make the bun soggy. You need to work fast, and sometimes it can be difficult to keep track of which buns you’ve done. My suggestion: Once you’ve poked a hole in a bun, put it back on the tray UPSIDE-DOWN. That way, its easy to see that any puffs the right way up have obviously not been done. To be really sure that the insides have dried out, once you have finished poking holes in each puff, you might like to return the tray to the oven for 5-10 minutes. Lower the heat slightly, or turn the oven off and leave the puffs drying as the oven cools. Pipe or spoon your favourite fillings into the buns and serve. A word or two about fillings: Wet fillings will make your choux pastry soggy. Whipped cream is pretty high on the ‘wet’ scale, so if you’re serving profiteroles, I suggest fill them just before serving. DON’T use cream from an aerosol – your hard work deserves more than that. And besides, I will personally hunt you down and spank you. Just kidding. (Or am I?? 😉 ) Custards and pastry creams are slightly better, and so can be filled with these a few hours earlier, though probably not more than 3 or 4 to be on the safe side. And that’s it. I hope I’ve covered everything you ever wanted to know about making choux pastry, and I hope that, if you were slightly apprehensive about having a go, you feel a little more confident. Please do let me know if there’s anything confusing – I’m quite happy to edit for clarity,. I’m well aware that just because it seems clear to me, doesn’t mean it’s clear for everyone. A great post, thank you so much for sharing all your hints and tips! I’ve always fancied making these but never actually given them a go so no more excuses now. Many thanks for a really lovely and helpful post. I’ve always wanted to try choux pastry but have been a bit daunted by perceived faffiness. This makes it so much clearer and so it’s definitely on the agenda now! Made Choux pastry last weekend but omitted the 2 tbsp. sweetened condensed milk because it was not available in my neck of the woods. My question however is what the added value of sweetened condensed milk is? They turned out great for a first try. The colour is light brown, shiny because I used egg yolk before baking the puffs. I made a photo of one but I cannot show you on your blog. The puffs tasted buttery and neutral. It certainly needs a filling. Mary-Anne, perhaps a weird question, but once you’ve made the choux paste can it be stored before baking for any length of time in the fridge/freezer? Or should it be baked immediately? THIS is the guide to choux pastry I have been seeking. Clear explanations and pix. You rock, you really rock. Hi Mary-Anne – great post, and thanks for saying when choux pastry was invented, I’ve always wondered when and why someone came up with it (and been very glad they did). Agree it’s good to know why a recipe says you should do something: it extends your knowledge and understanding of baking as a whole. Have you ever tried the Delia Smith tip of greasing the baking tray for choux, then sticking it under the cold tap so the tray has drops of water on the surface? I think it gives a slightly better result. Thanks for this – I have made 2 usuccessful attempts at making choux with my new fan oven. I understand whats going on now and fell more confident, I won’t be beaten! Hi Mary-Anne, love your blog, can’t wait for you to publish your book! I have a quick question for you: could you recommend anywhere I could pastry nozzles from or a particular brand? I wanted to get a set of large metal nozzles for doing cupcakes but also piping choux and pastry cream. All the ones I’ve found though are plastic and not particularly good… Thanks, have a good xmas! Thank you, your directions and explanations were so helpful! I used a recipe from an article i found in a food magazine, but used your tips and tricks – my first attempt at making them failed horribly (i think i took them out too early), but my second attempt turned out perfectly! What really helped was the turning down of the temperature after 10 minutes. Why unsalted butter? Will slightly salted work? That’s what I normally keep in. Thanks. Great explanations. As a guy I am always wondering “why” do they need this or that, or “what” does adding this do. The adding milk is interesting and will try it. My mother in law made Cream Puffs for years, but then I made better ones and they turned out more consistent and larger. Ladies just love a guy bringing a delicious sweet to a group function. Trouble is I have earned a reputation and now I need to look for new things to make. I like experimenting with different ideas, especially cheesecakes. My triple chocolate and raspberry cheesecake is a winner all the time. Thanks for these tips! I’ve tried making choux pastry once but they didn’t puffed out. I will try again with your tips! Thank you so much. Until reading your article I did not know why sometimes my pastry absorbed the right amount of eggs and at other times got to the right consistency with just only half the amount of eggs beaten in…and then they would not puff!!! I baked some over the weekend using my usual recipe that is not too different from yours but following your tips on making sure butter mixture was really boiling before adding flour and also drying out the flour well before taking it off the fire and they were perfect!!!! Good texture for pipping and they rose well in the over and when they came out they were crispy outside with nice hollow insides for the fillings. Thank you. Very helpful I’ve been making choux pastry for a while and its been very hard to keep a consistent rise I find once I’ve added the eggs my dough can still be dry and thus no rise occurs thanks to your tip with the egg whites my problem’s solved brilliant thank you so much. Oh my god oh my god oh my god!!! They worked!!! My piping work leaves a lot to be desired but that just means they look home made, as Mary Berry would say. I’m so over the moon!!! Thank you thank you!! I’ve never tried choux before in any form and that may be the second time I’ve used a piping bag since I was making a childish mess as a youngster on a milk crate so I could reach the bench, but I’m happy to assume that it was this recipe (that I even tweaked – no condensed milk, so a little sugar instead…) and detailed info and instructions that is responsible for my super impressive outcome. Today I had an interview to be accepted to study patisserie at Melbourne’s leading cookery institution, and in this moment – with my Christmas-level excitement – I just know it’s what I want to be doing. I’m so excited!! Very helpful! I was baking gluten free éclairs and this helped a lot! Can I make a double dough recipe at the same time? I have to make a large number. Absolutely. Just don’t cook huge amounts at once, as this will create too much moisture in the oven and adversely affect the baking of the buns. The dough is fine to sit on the side and wait its turn. Awesome detailed background and explanation on how to make Choux pastry. Was looking at a couple other recipes on the web but yours was the most detailed and clear in terms of explanation. Thanks a whole bunch! Will try making this! Thank you so much. I do feel a little more confident to try it now. And it would be nice for chocolate fondonts too.